Drought-crushing rains, record snowfall, unprecedented heat and destructive wildfires characterized a wild 2017 growing season on the West Coast. There was never a dull moment and the drama was high. Even so, we are really optimistic on what we expect to be a classically great vintage. California welcomed record rains from 130-220 percent of normal easing the previous five years of drought conditions. Oregon experienced the wettest winter in 35 years and record snowfall across the Cascades. The rains came down and while everyone gleefully watched reservoirs rise, we worked extra hard to achieve balance with increased vigor and spent more time in the vineyards to watch for any added pest or disease pressure. Most of the West Coast of California experienced a record-breaking three-day heat wave that brought triple digit temperatures to nearly every growing region over Labor Day, right as many vineyards were nearing ripeness. And then, just as harvest was reaching full speed, devastating wildfires hit the North Coast around Napa, Sonoma and Santa Rosa on October 9th. Tremendous winds made Sunday, October 9th an uneasy night in the North Coast. Gusts were intense, long, and they didn’t let up. Between about 9:30 and 11 pm four fires erupted around Napa Valley. The Atlas Fire roared down Atlas Peak and Soda Canyon Roads, hitting the Silverado Trail and climbing northward towards Yountville as it devoured homes, damaged wineries and singed vineyards along the way. The Tubbs fire quickly spread from north of Calistoga across Sonoma County to Santa Rosa where it caused massive destruction to life and property. The Partrick fire raged through east Napa to Carneros and the Nuns fire flared the northeastern hills of Sonoma Valley and eventually connecting with the Partrick fire back over to Mount Veeder and north to the Oakville hills. By Monday, October 10th and through the next ten days, most of the Bay Area and north was engulfed in smoke and the fires were a constant threat. Rolling evacuations and advisories displaced families. The fires destroyed infrastructure, shut down power, roads and closed businesses. In the meantime, fermentations were active and grapes were precariously hanging on the vines while clouded in smoke. Short staffed, and without access to trucks, vineyards and restricted access to the winery at times, we focused on safety and persevered, wearing masks and cranking generators to power the winery. All of our Sonoma County grapes were harvested before the fires started. Some fruit remained hanging during the fires in Napa County until we were able to safely get crews into the vineyards with protective masks. By October 20th, all of the fruit was in and the fire threat and smoke had begun to subside. We are meticulously testing grapes and fermentations as we evaluate whether any lots picked after the fires were affected. Early tests are incredibly promising, with little to no detection of smoke taint. We’re confident that our lab results will stay true through winemaking and the wines will be as stellar as any classic vintage. As we write this report and take stock of 2017, we are most grateful that despite some very real personal losses and huge obstacles, the Copper Cane team is safe and sound. Through all the hardships of 2017, we stayed true to our grape growing and winemaking philosophy, and it has proved to yield great results. The wines are stellar. After 140 to 180 percent above average rainfall through the winter, March brought sun and dry weather to finally allow us into the vineyards. From vineyards in Oak Knoll up to Calistoga, similar growth and weather patterns occurred in each of the sub appellations. Bud break kicked off in March, about 10 days behind normal. April brought rapid growth and big lush canopies with even, temperate weather. Bloom was slightly erratic due to differences in weather from mid May to the first week of June. We had an exceptional summer with warm days that never got too hot, and warmer than average nighttime temperatures. Veraison came in late July, also about 10 days later than normal. The Labor Day weekend heat wave with 110-115 degree temperatures pushed ripening along fast and immediately the growing season came back in line with normal. Sugars in Zinfandel, Cabernet and other reds for Beran, Carne Humana and Quilt all rose rapidly and thankfully most of the fruit weathered the heat pretty well. Harvest kicked in right after the heat wave and continued until October 20th. Yields were somewhat light also. Across Sonoma County and the Russian River Valley, above average winter rains led to a moderate season with no frost scares or significant abnormalities until the Labor Day heat spikes. Growth took off in April with healthy canopies that required control. Bud break was even and bloom suffered in some regions with ups and downs in warm and cold fronts. Yields varied by region and overall quality looks great. 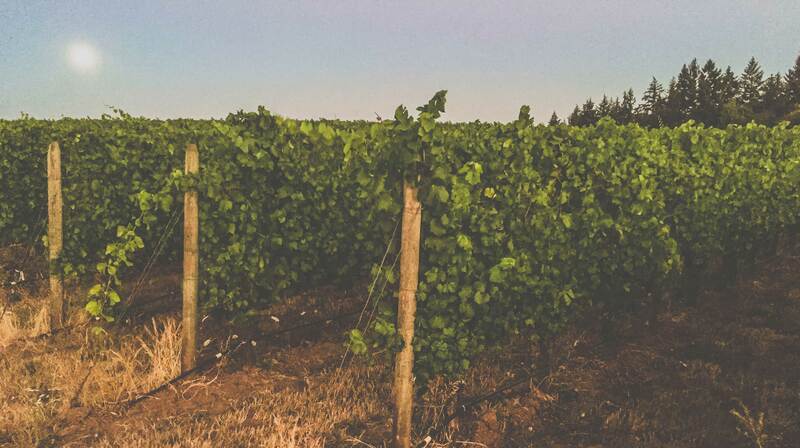 We source Pinot Noir and Chardonnay grapes from many different vineyards across the Russian River Valley for Steorra. Unique variances in site, soil, slope, and aspect add dimension, structure, and complexity to the overall blend despite growing conditions being relatively the same across the region. For 2017, rains were 160-170 percent above normal and cool weather delayed spring growth by 10 days to two weeks. Fruit set was erratic here as well, with a marine layer and warm extremes alternating with cool days during bloom in May, resulting in 30-50 percent lower yields in some vineyards. August was about five degrees cooler than normal. While we were waiting for acids to come down, the heat wave struck over Labor Day. All of the sudden we were picking like mad to get the fruit in at tip top shape, finishing in early September. At Dairyman Vineyard in the southern reaches of the Russian River Valley, we experienced similar conditions and fortunately had really good bloom and fruit set. Veraison was a bit late, about two weeks behind normal. After the Labor Day heat event, everything went into hyper drive ripening very quickly. We picked to the clone at Dairyman this year, with each clone ripening at a slightly different times. Harvest occurred over a two-week window, finishing around the fourth week of September. Much of our Beran Zinfandel comes from three esteemed Zin-growing regions in Sonoma County—Alexander Valley, Dry Creek Valley and the Rockpile AVAs. Rainfall was 130-140 percent of normal in Dry Creek. Very cool weather in spring delayed bud break by 10-14 days. Bloom and fruit set in late May produced a uniform set. A very warm June and July pushed into a cooler August with a persistent marine layer that slowed things down. Veraison was in early August, about one week behind normal. Heat early September shocked vines and everything that was close to mature ripened quickly, challenging our access to labor and harvest equipment. Harvest started the second week of September and wrapped up by the week of Oct 1st with yields 15-20% above normal. At higher elevations like Rockpile, rainfall was 220 percent above normal. Bud break started in March and we saw uniform, even growth and moderate weather until fluctuating conditions during bloom. Fruit set was fairly uniform and long, with even ripening following. Yields looked to be slightly above normal. The excessive heat spikes around Labor Day arrested growth and development as the vines went into heat stress. The Zinfandel we farm here had healthy canopies and the vines bounced back rapidly as the heat subsided. Harvest started the last week of September, concluding October 4th. Alexander Valley’s growing season was very similar to Dry Creek, although its inland location stayed slightly warmer during August’s cool spell in Sonoma County. As we saw elsewhere in Napa and Sonoma Counties, conditions during bloom fluctuated so fruit set suffered in some vineyards. Shatter was more pronounced here while we didn’t see the same in Dry Creek Valley. Alexander Valley weathered the September heat event pretty well. Yields varied, some vineyards were down 20-30 percent some were up 20-30 percent. Harvest started at the end of August and finished at the end of September. The Santa Lucia Highlands appellation sits on the eastern side of the Santa Lucia Range on a sloping bench between the Salinas Valley and Pacific Coast south and inland of Monterey. The region sits in the rain shadow of the mountains yet in this abundant year we received 140 percent above normal rainfall at Belle Glos Las Alturas Vineyard, one of the highest elevation vineyards in the appellation. The overall growing season brought a nice spring with uniform growth and a healthy fruit set, about 15 percent above what we were expecting. Days were warm, but not too hot and nights were slightly warmer than usual. Veraison came in late July to early August and happened very quickly. August was cool, with a persistent marine layer. The early September heat spike brought record temperatures; locals who’ve been in the area for 50 years couldn’t recall 115-degree temperatures ever in Soledad. After the heat, the fruit fared well, but the vines were stressed and sugars, phenolics and acids looked great so we picked the whole ranch in a matter of four to five days in early September. Santa Barbara County and Santa Maria Valley, home to Belle Glos Clark & Telephone Vineyard Pinot Noir, experienced a challenging start to the season with a lot of wetness and humidity keeping us on our toes. Overall, rainfall was 130-140 percent of normal in the region. Spring was cool and once warm weather arrived, growth came quickly with lots of water and nutrients for the vines. Bloom occurred in late may and after that it was a great growing season, not excessively hot with a nice marine layer cooling temperatures at night. Veraison finished in late July, a little later than normal. Wildfires nearby in the middle of the summer had no effect on the vineyard. While the Labor Day’s heat wave was less severe at Clark & Telephone, it still pushed harvest dates right up. Everything got ripe at once and harvest wrapped up quickly with average yields in mid September. In 2017, Oregon recorded its coldest winter since the mid 1950s, the wettest winter in the last 35 years and record snowfalls across the Cascade Range. Spring growth started three weeks behind 2016, more in line with normal. Despite a very cool spring, there were no threats of frost and growth was even. As most of the regions approached bloom, weather dictated set depending on which clones were going through bloom and if the vineyards experienced favorable weather. Summer started with warm weather at end of May and carried on to be nice all June and July, catching up growth. Despite large fires across the state in late July and early August, we didn’t find a concern for wine quality because the smoke sat at a very high altitude. The diminished sunlight did cause a delay in ripening. Early testing shows no smoke damage from the fires. During harvest, overall acids were good, flavors ripened ahead of degrees brix. On average yields were very good and we are particularly impressed with Oregon in 2017. The wines are showing beautifully in tank already. We source fruit from across the three regions below for Elouan Pinot Noir and Rosé. After a cool winter in Willamette Valley, we saw unusually hot days after and cool nights, but fairly uniform growth patterns overall. Bud break and early vine growth were normal to about 10 days behind. Veraison started well into August, a month behind 2016 and about a week behind normal. A warm September and first few weeks of October made a big difference in ripening, despite the late veraison. We finished picking Willamette valley prior to rains on Oct 18th, with above average yields. A wet winter with 150-200 percent above normal rainfall gave way to a very slow and deliberate bud break, 10-14 days behind normal. Fruit set was a little more variable in the Rogue valley due to cool spring weather and intermittent rain. It was a very nice summer with good growing conditions running initially about two weeks behind normal and then catching up. Veraison came at the end of July into early August, one week to 10 days behind. Ripening occurred slowly after that due to the high smoke that diminished sunlight. After a little rain, the smoke cleared out and warmer weather kicked into gear. Yields were above normal despite the fruit set. September warmed, then an unusual rain event occurred, not harming any vineyards. We finished up harvest by November 1st. Umpqua experienced high rainfalls like the rest of the state. Bud break and spring came very late, as much as three weeks behind normal. Veraison came in August delayed by about two weeks and after that the season continued to be late. The largest effects of the fires on Oregon’s southern coast were seen in Umpqua Valley as the winds needed to blow the high level smoke out never came. Once sun did come out and fires faded, we had uniform growing days, nice cool nights in mid 50s and low to mid 80s during the day. Harvest wrapped up at the beginning of November.